Mahasattva is a luxury Lagoon 620 catamaran available for crewed charters in the Caribbean and is based in the British Virgin Islands. Mahasattva offers luxury accommodation for up to 8 guests, with personal chef and an open bar. Come and experience the vacation of a life time, aboard this popular sailing catamaran. Save 15% off new reservations sailing now through 15 November 2019. Applies to new reservations 6 nights or longer. Available now through 15 Nov 2019. Confirm before 18 Oct 2019. Contact us for rates and current availability or to book a charter aboard Mahasattva! 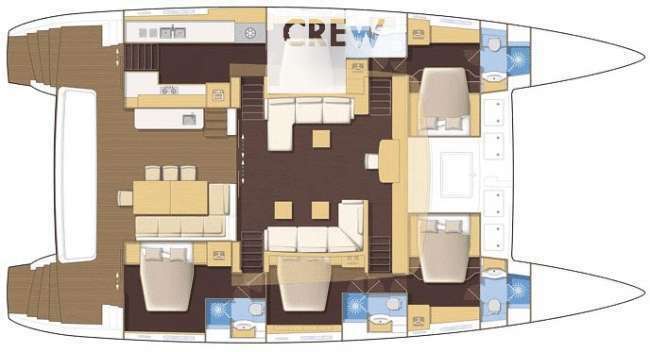 Mahasattva accommodates 8 guests in 4 cabins, all en-suite with stall showers and electric toilets.